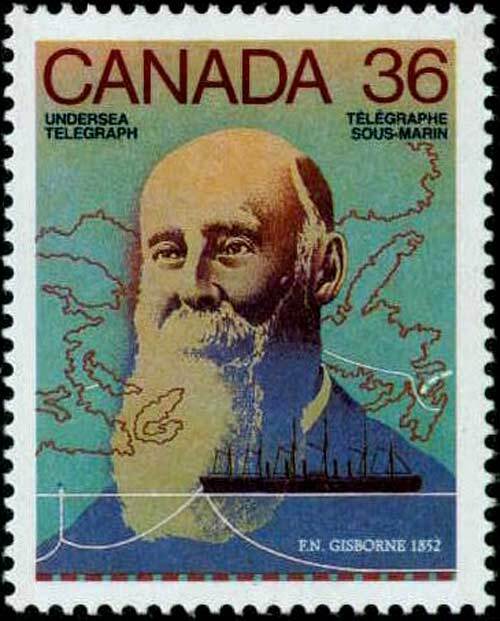 Introduction: Frederic N. Gisborne was the proponent of the cable line across Newfoundland which ultimately led to the Atlantic cable project. This biography of Gisborne is taken from A Cyclopaedia of Canadian Biography: Being Chiefly Men of the Time, written and published in 1886 by George Maclean Rose of Toronto. Although his first name is sometimes given as Frederick, entries in marriage and death registers, as well as his headstone at Beechwood Cemetery in Ottawa, confirm that it was Frederic. See also the entry for Frederic Gisborne in the Dictionary of Canadian Biography Online, Library and Archives Canada. Some of Gisborne’s early papers, including a journal from 1851 and his notes on the Atlantic cable, are at Victoria University Special Collections. A digital copy of the second volume of Gisborne’s journal is viewable at Memorial University Digital Archives. Rose’s comment in this article that Cyrus Field had been “a licensed junk dealer and a well-to-do dealer in rags, etc., for paper manufacturing”, while factually correct, was a somewhat unkind description of Field’s business at the time he met Gisborne. This derogatory reference was occasionally used by those who did not particularly care for Field’s success as one of the so-called Robber Barons of New York. 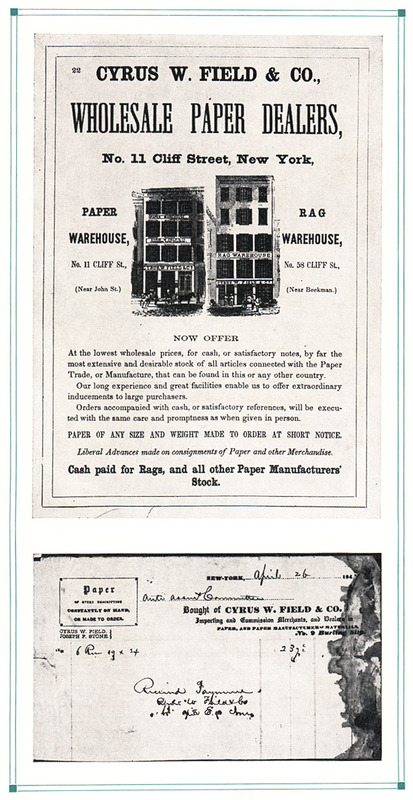 Field had been a very successful paper manufacturer and wholesaler, and, as paper was made from rags, he needed a constant supply. To this end he was licensed by the City of New-York and included in the Corporation’s “list of the licensed keepers of junk shops”. This was, of course, only incidental to his main business. 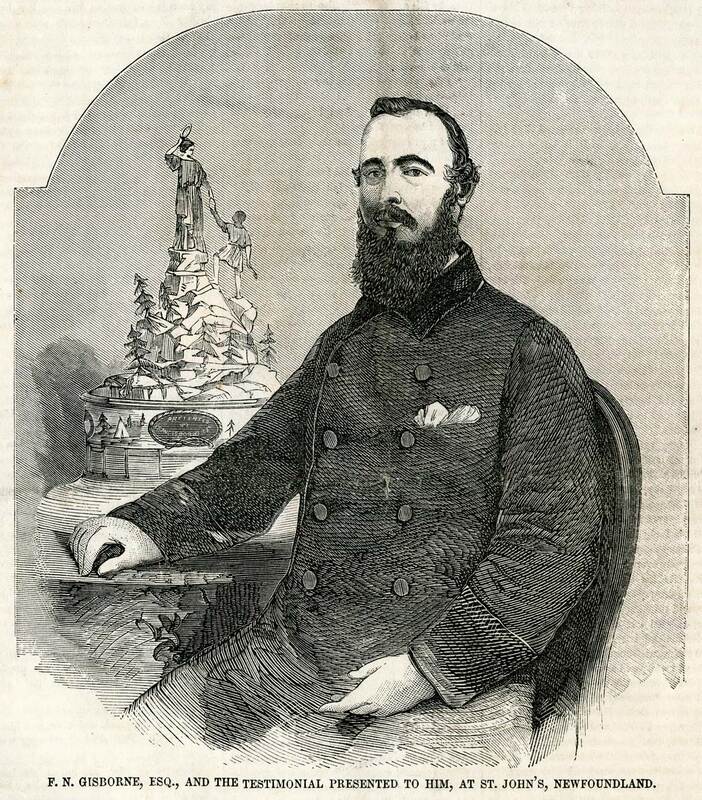 Following the biography is an 1859 article from Gleason’s Weekly describing and illustrating the silver statuette presented to Gisborne in 1857. 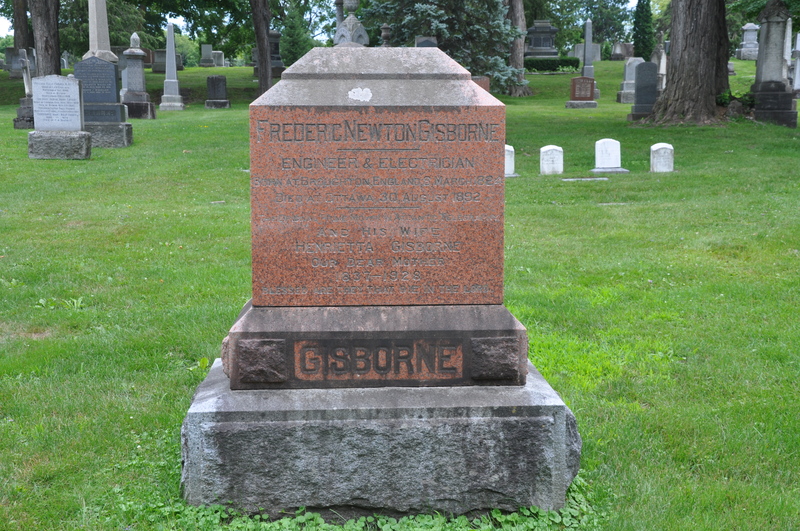 In 1879, Gisborne was appointed superintendent of the Canadian government telegraph service, and he held this position until his death in 1892. During their long connection with the county, the Gisbornes have been prominently associated with many public movements of importance, several of their number greatly distinguished themselves for their philanthropy and enlightened service. The Rev. F. Gisborne left large bequests to different county institutions, and founded many charities. He also left the princely sums of £10,000 to Greenwich hospital, and £20,000 to St. Peter’s College, Cambridge, with which fund “Gisborne Court” was built and some scholarships established. The late Rev. Thomas Gisborne, prebend of Durham, whose eldest son was M.P. for North Derbyshire, and for Carlow, Ireland, and his brother, John Gisborne, of Darley Dale, were widely known and respected. Several members of the family were Cambridge wranglers and mayors of Derby, and have acquired a family connection with the Poles, Batemans, Byrons, Babingtons, Darwins, Evans, and other houses of historic note. Frederic Newton Gisborne, the subject of this biography, is grandson of John, and eldest son of Hartley P. Gisborne, of Darley Dale, Derbyshire; and on his mother’s side received his second name from her famous ancestor, Sir Isaac Newton. He was educated by the Rev. R. Pidcock, vicar of Warslow, Staffordshire, Dr. Cowan, Toxteth Park, Liverpool, and Rev. W. Thompson, of Cheadle, Cheshire, assisted by special instructors in mathematics, civil engineering, botany, etc. In January, 1842, young Gisborne started upon a journey round the world, and during a tour of three and a half years visited the Cape de Verd and other Atlantic ocean islands, Australia, New Zealand and the Society islands, where he remained some time, taking an active part in withstanding the French occupation of those islands. He quitted Tahiti when the natives were defeated and Queen Pomare was banished to Bola-Bola. He then visited Pitcarn’s Island, the romantic home of the descendants of the mutineers of H.M.S. Bounty, where he was the guest of October Christian, the first child born upon that island. After touching at several other groups he arrived at the Sandwich islands, visiting during subsequent explorations Mouna Roa, the grandest volcano in the world, on the island of Hawaii. Thence he sailed to the Gulf of California, and landing upon the coast, rode across the continent to Vera Cruz, via the City of Mexico. He then travelled through Yucatan and Guatemala, and being from youth a keen sportsman and unerring rifle shot, had many stirring adventures during his travels, which terminated pro tem by his return to England during the spring of 1845. Finding, upon arriving home, that family affairs necessitated prompt action and example, Mr. Gisborne, accompanied by his younger brother Hartley (who, some years later, became Director of telegraphs in Egypt, where he resided for nearly twenty years) sailed for Canada, where they arrived during July, 1845, and almost immediately afterwards purchased a farm near St. Eustache, where they resided until May, 1847. Finding such pursuit uncongenial, and noting the successful advent of the electric telegraph in England and the United States. F. N. Gisborne became one of the first operators of the Montreal Telegraph Company, and for that company opened the first station at Quebec, in the old Merchants’ Exchange. Associated with the leading men of Quebec, the British North American Electric Telegraph Association was then formed for the purpose of connecting the Maritime Provinces with the Canadas, and with the liberal consent and good will of the Montreal company, Mr. Gisborne was appointed general manager of the association, and was deputed to visit New Brunswick and Nova Scotia, where he explained the new science to the legislatures, then in session, and lectured before the public on the practical value of telegraphic communication throughout the continent. His mission was so successful that the government of Nova Scotia undertook to erect a line from Halifax to Amherst conditionally upon Mr. Gisborne’s services being transferred to them by the association which he represented. This request was finally agreed to, and Mr. Gisborne returned to Quebec via the north shore of New Brunswick, during which journey he walked on snowshoes between Campbelltown and Metis, dragging over 100 lbs. weight on a toboggan across the Gaspé mountains, 108 miles, within three days. For this service he was awarded a handsome gratuity by the association. From the spring of 1849 to 1851, Mr. Gisborne was superintendent and chief operator of the government lines at Halifax, during which period he was observant of the discovery of gutta-percha as an imperishable, subaqueous, insulating material, prior to which he was associated with the Hon. F.O.J. Smith, of the state of Maine, in several practical experiments for conveying electric signals through submerged uninsulated metallic circuits. 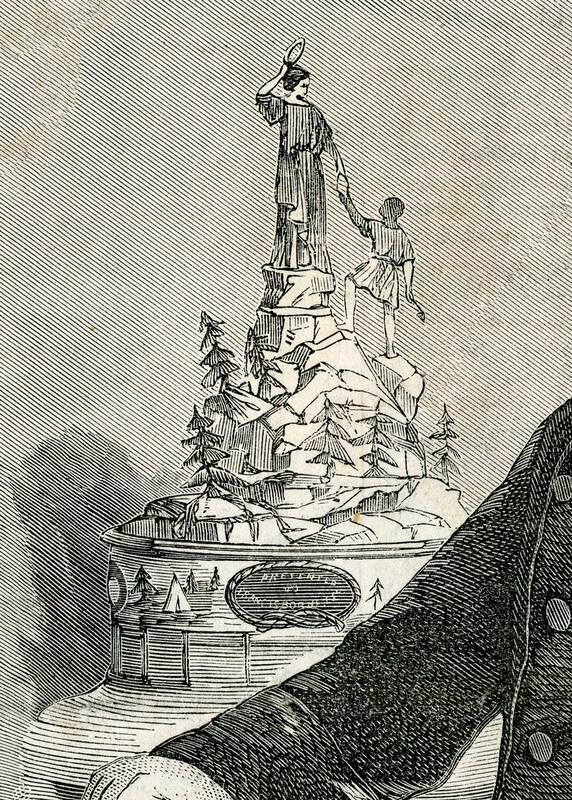 Shortly after his arrival in Halifax, Mr. Gisborne strongly advocated an attempt being made to establish telegraphic communication with the Island of Newfoundland, and by permission of the government of Nova Scotia, during the winter of 1850-51, visited that Island, with this special object in view. When there he contracted to erect a land line between St. John’s and Carbinear, via Harbour Grace, which he completed that summer; and started on September 1st, 1851, with a party of six men to survey on foot a practical route across the widest and most rugged section of Newfoundland, from St. John’s westward to Cape Ray. Parting with his men, mid-way at Long harbour, whence they returned by boat, Mr. Gisborne accomplished the remaining two-thirds of the journey, accompanied by two Indians, one of whom died within a few days, from the hardships encountered. During the winter session of 1851-52, the legislature of the island granted to F.N. Gisborne, and his associates, a telegraph construction charter, with exclusive privileges for the term of thirty years, and, by permission, with most flattering testimonials from the government of Nova Scotia, Mr. Gisborne resigned his superintendency, and a good salary to carry out the enterprise, which he had himself projected and initiated. He then visited New York, and there obtained an assurance of all the capital required from Horace B. Tibbetts, and D. B. Holbrooke, of New York, and from Thos. A. Dexter, and General John Tyler, of Boston; and upon his return to Halifax, laid before the Hon. Joseph Howe, the then astounding and apparently chimerical project of a transatlantic submarine cable connected between Newfoundland and Ireland. The annexed letter from Mr. Howe, when Secretary of State for Canada, and the published correspondence between J.W. Brett, and Mr. Gisborne, in the early part of 1852, (one year after the laying of the first ocean cable, between England and France), are proofs positive, that to Mr. Gisborne, and to Canada is due the credit of the conception and primary practical movement for transatlantic telegraphy, and if further evidence be required, note an appendix to the Rev. M. Harvey’s text book of the history of Newfoundland, Mr. Harvey being personally conversant with the enterprise from its earliest initiation. On the 20th of November, 1852, Mr. Gisborne, under exceptionably difficult circumstances, laid the first ocean cable on this side of the Atlantic, connecting Prince Edward Island with New Brunswick, and when occupied with several hundred labourers, during the following spring, of 1853, in constructing the land line across Newfoundland, the New York capitalists disagreed among themselves, as to a division of their respective interests in the undertaking, and stopped payment, thus leaving Mr. Gisborne responsible for $50,000 of indebtedness, over and above the proceeds of his private property, in sealing vessels and land, which he at once utilized in part payment of the company’s liabilities. The government of Newfoundland, also assisted in paying labourers’ wages in a most noble and liberal manner, relying upon Mr. Gisborne’s assurance, that he could and would re-organise the enterprise. In accordance with such promise, Mr. Gisborne again visited New York, during the winter of 1853-54, and there, for the first time, met Cyrus W. Field, who was at that period, a licensed junk dealer and a well-to-do dealer in rags, etc., for paper manufacturing, but had no connection with telegraphy whatsoever. After examining Mr. Gisborne’s plans, and reading his correspondence with Mr. Brett, Mr. Field was greatly impressed with the immense importance of the enterprise, and their after negotiations terminated by Mr. Gisborne returning to St. John’s, Newfoundland, accompanied by Cyrus W. Field and his brother Dudley, the well-known lawyer, when the legislature, per Mr. Gisborne’s petition, cancelled the original charter to himself and his associates, and granted a new one to the New York, Newfoundland, and London Telegraph Company, incorporating Peter Cooper, Moses Taylor, Marshall O. Roberts, Chandler White, Cyrus W. Field, and Frederick Newton Gisborne, with extended privileges and exclusive rights during a period of fifty years from that date. [Note: contrary to the statement above, Gisborne is not listed as a director in the charter]. Mr. Gisborne was appointed chief engineer, but, for good and sufficient reasons, resigned within a month, and the remainder of that year travelled throughout the United States. After great waste of capital in an unsuccessful attempt to construct the land line across Newfoundland, under the management of Mr. Field’s brother Mathew and other American engineers, Mr. Gisborne was solicited and again accepted the chief engineership, and by the first week of October, 1856, completed the work to the entire satisfaction of the company, receiving from the venerable philanthropist, Peter Cooper, as president of the enterprise, a flattering testimonial as to his skill, energy, and integrity. 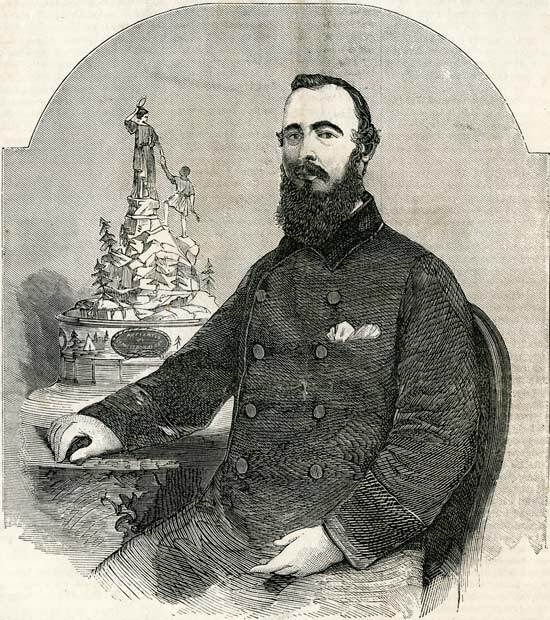 Mr. Gisborne then engaged with Cyrus W. Field and the late Sir Edward Archibald, British Consul at New York, to proceed to India, and there, upon joint account, secure privileges and pecuniary assistance for submarine cable connection with Bombay, via the Red Sea, with further eastern extension; but, upon arriving in London, he became acquainted with facts, re C.W. Field’s private negotiations with Mr. Brett, re transatlantic connections, which, among other reasons, induced him to abandon the contemplated journey and all connection with telegraphy, pro tem. That Mr. Gisborne committed a grave error by abandoning a profession in which he had become eminent, he is now free to allow. For several years he afterwards devoted himself to mining pursuits, during which time he explored the island eastward around the coast, from Cape Ray to the Straits of Belle Isle, being associated in several ventures with his staunch friend, the late Hon. Charles Fox Bennett, at one time premier of the colony. While actively engaged in such pursuits, he met with a severe gun shot wound, which for some time incapacitated him from physically arduous explorations, and returning to London devoted his attention to scientific pursuits and inventions. While there he had the honour of representing the interests of Newfoundland, as acting Commissioner, at the great exhibition of 1862, and three years later again, represented that colony at the great Paris exhibition of 1865. He was also appointed London Agent for mines and minerals by the government of Nova Scotia, and, during 1869, again crossed the Atlantic to investigate the gold quartz leads of that province. Meanwhile, during his residence in London, Mr. Gisborne was a regular exhibitor at the soirees of the Royal Society, and was noted for the variety and value of his inventions, for which nine medals have been awarded. Among these were:—His electric, pneumatic, and mechanical ship signals; anticorrosive and anti-fouling compositions for the bottoms of iron ships; the electric recording target, improvements in gas illumination, etc. We may here add that his semaphore was awarded a gold medal at our late Fishery Exhibition in London, his latest inventions being an anti-induction cable, an iron telegraph pole with iron cross arms, which have been adopted by the Canadian Government for use on their northwest prairies, and an improved telephone. His recent maps of Canada are also in high repute. During his visit to Nova Scotia in 1869, Mr. Gisborne became interested in the coal fields of Cape Breton, where, as chief engineer of an English company, which finally expended over three millions of dollars in that country, he established and developed the Reserve, Lorway, Emery, and Schooner Pond collieries; superintended the construction of the Sydney to Schooner Pond railway; and, as contractor, constructed the Lorway to Louisburg railway, in all forty-two miles in length, with two immense shipping piers at Sydney and Louisburg harbours. The then existing high price of coal, and anticipated increasing value of coal fields throughout the world, having proved to be temporary and fallacious, the company collapsed, and, consequent upon such unlooked for disaster, Mr. Gisborne had to begin the world afresh, at an age when the best energies of most men are on the wane. For a season gold mining in Nova Scotia continued to occupy his attention, but, prospects being discouraging, Mr. Gisborne, in 1879, was offered and, accepted the superintendency of the Dominion Government Telegraph and Signal Service, the position which he at present occupies. The successful and satisfactory manner in which he has carried out the Hon. Dr. Fortin’s gulf cable scheme, reorganized and made remunerative the British Columbia service, and rapidly constructed first-class military telegraph lines in the North-west, during the late rebellion, is a matter of present history; and his numerous and most flattering testimonials from the various governments and companies whom he has faithfully served, are the best evidences of the usefulness of his career. Mr. Gisborne is a ready speaker, and has lectured frequently upon a great variety of subjects. He is also a pungent writer of press articles. Mr. F.N. Gisborne married, 1st September, 1850, Alida Ellen, second daughter of the late I.E. Starr, Halifax, Nova Scotia, by whom he had two children. She died in Prince Edward Island, January, 1854, at the early age of nineteen, and in April, 1857, Mr. Gisborne married Henrietta, youngest daughter of the late Francis Hernaman, of Broadmead, Newton-Abbot, Devon, England, by whom he has four children now living. The eldest, Francis H., is one of the barristers in the Department of Justice, Ottawa ; and the second, Hartley, is district superintendent of the Government Telegraph Service in Manitoba and the North-West provinces. Mr. Gisborne is one of the original fellows nominated to the Royal Society of Canada. He is a member of the Institution of Engineers and Electricians, London, England, and has from time to time been a member of the Society of Arts and other scientific institutions. He is a member of the Church of England, and broad and liberal in his views. He is thoroughly conversant with the resources of the Dominion, having resided in and travelled over every province of Canada, has been the direct means of introducing a very large amount of capital and much skilled labour into the country, and has undoubtedly at heart the best interests of the Dominion with which he has been so intimately connected for over forty years. MY DEAR GISBORNE,—Without desiring, in the slightest degree, to undervalue the services rendered to civilisation by the body of eminent men who have just been rewarded for laying the Atlantic cable, I own to some feeling of disappointment in not seeing any mention made of your name, as I have reason to believe you were the first pioneer of the enterprise, as well as the original promoter of electric telegraphy in the Maritime provinces. In the winter of 1848 you came to Halifax and interested the government, of which I was a member, in the subject of telegraphic communication. A bill was introduced, and £4,000 was expended by the government for construction of lines to connect Halifax with New Brunswick, Canada, and the United States. When that line was completed, you were employed to manage it under a commission, of which I was the chairman, the Hon. George Young and William Murdoch, Esq., being the other members. This line was subsequently purchased from the government ,by a company, which has since extended branch lines to every shire, town, and seaport in the province. In 1850 you discussed with me, and subsequently laid before the commissioners, a plan for connecting Newfoundland with the Continent of America, and obtained leave of absence to enable you to go to that island and secure support to the project. My brother commissioners are both dead. On your return you asked leave of absence to go to New York to promote an extension of the line to England, and spoke confidently of being able to extend it across the Atlantic, and connect Europe with America. Up to this time I never heard the idea suggested, and, though reading the English and American papers, never saw any allusion to the practicability of such an enterprise. As no capital could be got in Halifax, you naturally sought in London and New York for co-operation and assistance. I do not, of course, know what took place abroad; but of this I have no doubt, that until you went to New York nobody had suggested or taken any steps towards promoting an Atlantic telegraph. As the ORIGINAL PIONEER AND PROJECTOR of this great work, it appears to me that you ought to place yourself in your true position, and that, if not included among those who are to be honoured and rewarded, you should at least endeavour to obtain from your countrymen, and from the world at large, who are to be benefited, the recognition which you deserve as the ORIGINATOR AND PRACTICAL PRIME MOVER of the great enterprise now so happily brought, by a combination of public-spirited and able men, to a fortunate consummation. It ought not to be forgotten that the very line across Newfoundland, now used by the Anglo-American Company, was originally, at great pecuniary sacrifice and risk of health, explored by you and constructed by yourself as chief engineer of the New York, Newfoundland, and London Telegraph Company. Believe me, very sincerely yours, (Signed), JOSEPH HOWE. London, 25 Saville Row, Feb. 12, 1867. Rose, George Maclean: A Cyclopaedia of Canadian Biography: Being Chiefly Men of the Time. Toronto, Rose Publishing Co., 1886. 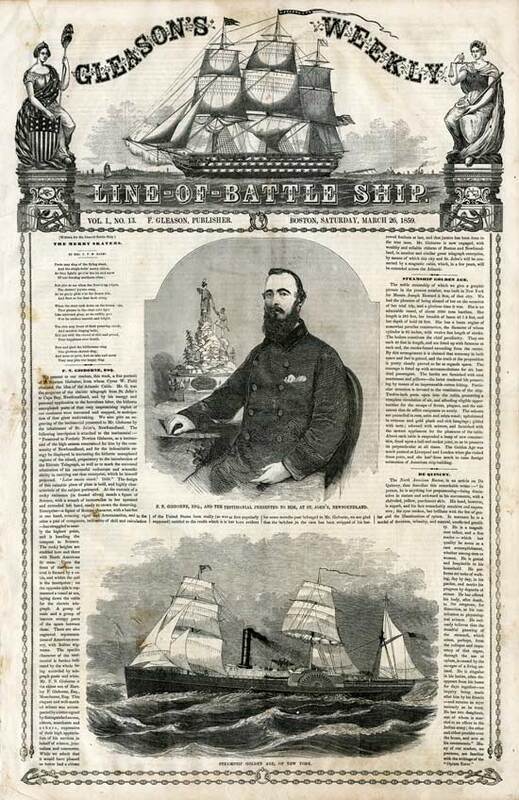 Gleason’s Weekly Line-of-Battle Ship, Vol. 1., No. 13. Boston, Saturday, March 26, 1859. The design of this valuable piece of plate is bold, and highly characteristic of the subject portrayed. At the summit of a rocky eminence (in frosted silver) stands a figure of Science, with a wreath of immortelles in her upraised and extended left hand, ready to crown the deserving Enterprise—a figure of Roman character, with a hatchet in one hand, evincing vigor and determination, and in the other a pair of compasses, indicative of skill and calculation—has struggled to nearly the highest point, and is handing the compass to Science. The rocky heights are studded here and there with North American fir trees. Upon the front of the base an oval is formed by a cable, and within the coil is the inscription; on the opposite side is represented a vessel at sea, laying down the cable for the electric telegraph. A group of seals and a group of beavers occupy parts of the space between these. There are also engraved representations of American scenery, with Indian wigwams. The specific character of the testimonial is further indicated by the whole being encircled by telegraph posts and wires. Mr. F.N. Gisborne is the eldest son of Hartley P. Gisborne, Esq., Manchester, Eng. This elegant and well-merited tribute was accompanied by a letter signed by distinguished savans, editors, merchants and others, expressive of their high appreciation of his services in behalf of science, journalism and commerce. While we admit that it would have pleased us better had a citizen of the United States been really (as was at first popularly supposed) entitled to the credit which it is has been evident for some months past belonged to Mr. Gisborne, we are glad that the jackdaw in the case has been stripped of his borrowed feathers at last, and that justice has been done to the true man. Mr. Gisborne is now engaged, with wealthy and reliable citizens of Boston and Newfoundland, in another and similar great telegraph enterprise, by means of which this city and St. John’s will be connected by a magnetic cable, which, in a few years, will be extended across the Atlantic.